I breastfed all three of my kids. The first two times I didn’t get to truly enjoy the experience because I didn’t know how to fully embrace the breastfeeding journey. I lived in old T-shirts and black leggings which didn’t help when it comes to loving my post-baby body. This time I finally cracked the secret code to dressing while breastfeeding. In fact, I realized I don’t have to dress that differently and can maintain my personal style as long as I keep in mind a few things. Here are five styles that are perfect for breastfeeding mothers. Wrap dresses can be found in so many different styles, colors and prints and are perfect for breastfeeding. It provides easy access for feedings and looks cute. Many nursing dresses come in this style but even non-nursing wrap dresses work just fine and are often priced less. Off the shoulder dresses and tops are right on trend and perfect for nursing mamas. Off the shoulder styles provide easy access for feedings (you can simply pull the top or dress down) and all you need is a quiet place and cover for nursing. I love dusters and long cardigans because it provides extra fabric for extra protection. I’ve even used it as a nursing cover/blanket when I forgot to pack mine. Dusters and long cardigans are cute, versatile and such an easy layering piece for any busy mother. I love these maternity + nursing tops from ASOS because they’re affordable, comfortable and versatile. You can wear them while you’re pregnant and even after when baby is born. It comes in different colors and sleeve lengths. These cross front nursing tank tops are the best! In fact, I don’t wear nursing tops and tanks with snaps and hooks anymore because these cross front tops are so much easier to wear. You should have a few of these on hand and layer them under your clothes. I wear these all the time under my clothes during the day and as pajamas at night time. You can find affordable 3-packs on Amazon here. These are my current favorite looks for nursing. As you can see, I wear a lot of wrap dresses, loose tees and dusters to stay fashionable without sacrificing comfort. You can find more on my Instagram. 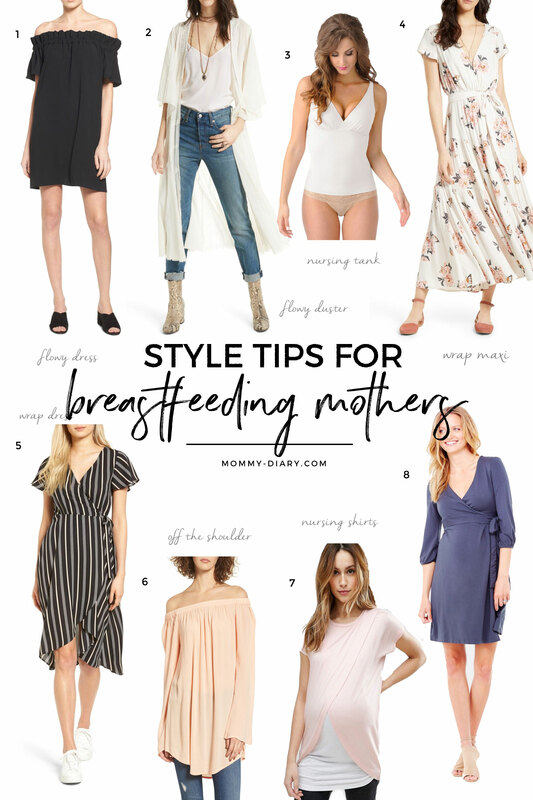 What do you think about my style tips for breastfeeding/nursing mothers? What do you like to wear while nursing? If you enjoyed this post, please pin the image below. It helps more mothers find this post and supports this blog! This is such a great and much needed guide. I was so at a loss when I was breastfeeding as to what I could wear. It happens to most of us. Glad you found it useful. Off the shoulder and comfy tank tops all the way for you! Congratulations! Yes to all of this!!!! I breastfed all four of my kids at one point. Our last baby (a girl after three boys) was the best nurser! I just weaned her at 18 months if I Haden’s she would nurse forever I’m telling you. Awesome ideas – love all your looks and your sweet little baby too!!! Definitely referring all my new mommy friends to this post! That would be great. Thank you so much mama! Love your beautiful name. I am currently breastfeeding my third child, so I totally needed this post. I’m always on the lookout for cute nursing friendly styles! I’m glad you found it useful. Cheers to breastfeeding mama! Love your style momma, you are totally rocking this breastfeeding style.I simply adore the off shoulder season right now. Thanks so much! yes I love the off the shoulder style right now too. Perfect for spring and summer! I actually am working on a nursing spring wardrobe blog post myself! These are all super cute outfits! Love! These are such cute looks. I need to get some dresses like those! Thank you Ashley. Yeah you can’t go wrong with these dresses! Wardrobe staples! Long cardigans and wrap dresses FOR THE WIN. Seriously. They were (and are) a lifesaver. You are gorgeous!!! I love all the pieces that you picked out. 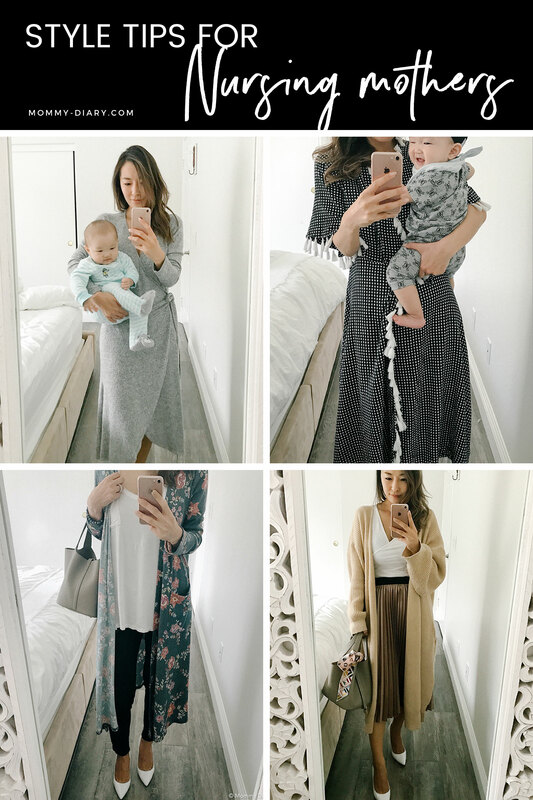 Cardigans are my favorites for nursing little bitty babies, when they get bigger I give up on special nursing clothes all together and just go back to my normal wardrobe. Long cardis are a mom’s breastfriend ? Seriously though, such good ideas! Cute ideas! Where is the gray wrap dress and the long floral cardigan you are wearing in your pics from?